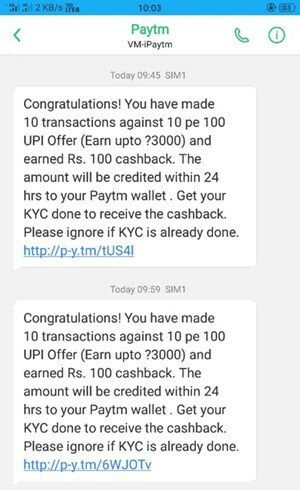 Paytm UPI offer: Now earn 3000 Rs in Paytm without doing any real transactions. Just keep balance less than 10000 Rs, your transaction will be failed but paytm will track it for the offer. It’s a bug in Paytm and may be fixed anytime. So avail this offer as soon as possible. Please note – This trick is for educational purpose only. We are not responsible if Paytm revert your cashback or take any such action. Use this trick at your own risk. This bug may be fixed any time – Use as soon as possible. Login and add your bank account. Now enter any @paytm UPI address. Enter amount minimum 10000 Rs. Trick starts here – Keep your Paytm linked bank account balance less than 10000 Rs. So transaction will be failed from your bank but due to bug in Paytm, it will be tracked for 10 pe 100 offer. So transfer Minimum 10000 Rs, 10 times and you will get 100 Rs cashback. Again, Go to cashback offers >> Choose offer >> send 10 times >> You will get 100 Rs cashback. You can participate in this offer 10 times, So total you can earn 30*100= 3000 Rs by sending money. What to do if your transaction is not tracking? If paytm is not tracking your transaction of 10000 Rs, sending in any random number like 10001, 10002, 10003 etc. and your each and every transaction will be tracked by paytm (Successfully verified 20 times). Paytm UPI offer: Now just pay using Paytm UPI address and you can 30 Rs cashback every day. Offer valid until 30 April 2018. This offer is valid only for all Paytm users and valid once per user/ every day. Cashback will be created within 48 hours. Follow given steps below to avail this Paytm UPI offer to get free 30 Rs every day. How to avail this Paytm UPI offer? That’s it, It will auto verify your mobile number by sending SMS. Now pay using UPI and you will get 30 Rs assured cashback. Read terms & conditions for more info. Offer valid once per user/Everyday. Means you can use this offer one time every day until 30 April 2018.